The rectory for St. Peter's Anglican Church was built from l862–65. It was constructed for Reverend Abraham Cowley (l8l6–l887), the English missionary responsible for the Aboriginal congregation of the Parish of St. Peter’s. Between l896 and l957 the rectory functioned as a Federal tuberculosis hospital for Aboriginals. 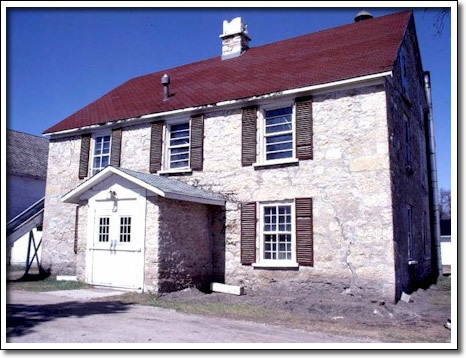 The hospital was the only such facility devoted to Aboriginal health care established in Manitoba. In l962 the property, including the old rectory, was reoccupied by the Anglican Church and became home for St. John's Cathedral Boys' School. The rectory is one of only a few remaining stone houses from the Red River Settlement era. Five others are concentrated along River Road, south of Lower Fort Garry. These structures are a product of the Georgian architectural tradition of eighteenth century Britain, which produced buildings of symmetrical composition enriched with classical detail. In Manitoba, such houses represented the pinnacle of Red River domestic architecture.